Address:Labkhandagh Alley, Qiam St., Yazd, Iran. A marvelous traditional boutique hotel which is used as Hotel and the culture and architecture of this region is illustrated in it. Located at the heart of the historical monuments of this city such as Amir Chakhmagh Square and the traditional market of Yazd city. This fabulous place has modern facilities such as , TV and Internet .Here is where you can surely experience one of the most memorable stays of your whole travel in Iran, and at the same time you can spend time at its beautiful yard and sit on the bed filled with the odor of flowers and you will definitely enjoy its beautiful view. Mehr Traditional Hotel Yazd to Yazd water Museum. 5 min.walk. Mehr Traditional Hotel Yazd to Amir Chakhmaq Complex. 7 min.walk. Mehr Traditional Hotel Yazd to Jame Mosque Yazd. 7 min. walk. Mehr Traditional Hotel Yazd to Dowlat Abad Garden. 8 min by car. Mehr Traditional Hotel Yazd to Zoroastrian Fire Temple. 10 min by car. 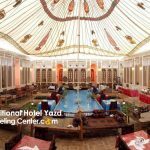 Mehr Traditional Hotel Yazd to Yazd Airport. 21 min by car.